A lot of guys have been messaging me on social media asking how to date a friend. There are a couple of scenarios here. Either you were already friends, and you’ve grown to like her over time, or you already liked her when you met and set up a fort in the friend zone. You didn’t show intent when it counted, and now your relationship feels like a ticking time bomb. The great thing about dating a friend is that you already have a deep rapport. That’s a beautiful, time-earned thing, and couples work towards it for years. The real challenge lies in the transition the other way – taking a platonic relationship and making it sexual one. Time can’t solve this one by itself. You have to escalate and show your sexual intent. You have to be active about these feelings. It’s more of a risk if you don’t – you run the chance of never leaving the friend zone. Continuing to play the role of a platonic friend prevents the connection from being genuine, as the two of you have conflicting ideas about what you want from it. 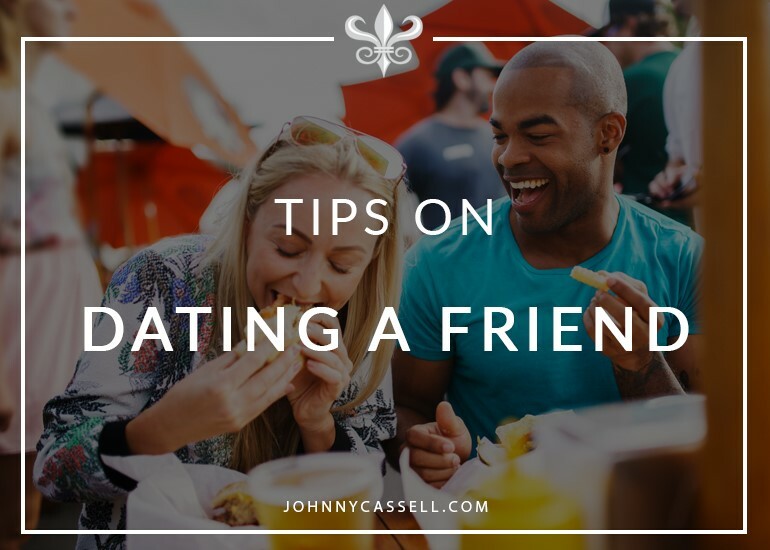 Keep in mind that dating a friend is going to be a slow, deliberate process. It will take time and dedication. But if you’re attracted to one of your friends, you must feel that she deserves the risk and the effort. So take the required time. Don’t do it in a way that’s sudden, confrontational, and weird. Follow these steps, gradually, and you will be able to shape yourself as a sexual being in her mind. When you get there, that sexual next step will feel like the most natural thing in the world. You’ve got to take the risk to get the reward. You have to get into an almost daredevil mindset for this. If you set out with enough intent and a willingness to be open, you will be absolutely set to redefine your relationship with her. Even realising that intent and knowing you have to take action will be enough to sow the first seeds of your behavioral changes. It’s no longer fair on either of you to keep up the pretense of friendship when it’s not what you want. You will simply continue to plow time and energy into a relationship that isn’t fulfilling you. Start in small, subtle ways. Maybe you don’t usually make a whole lot of eye contact – switch this up, and instead start to hold eye contact for longer. If you’re normally quite a stiff person, perhaps start paying a little more attention to how you dress or work on fully relaxing your body language. When I’m working on altering outward behaviours, I will change the thoughts I’m having, and those thoughts will be transmitted outwardly through my eyes. I don’t have psychic powers, and I’m assuming you don’t either. But having that mindset and actively running those sexual thoughts in your head during contact will broadcast some of that sexuality through your eyes, and unconsciously change a few of your behaviours. Don’t be so available. Create demand by scarcity. Make her realise she’s beginning to miss you and desire your companionship. Maybe don’t text her as much, definitely don’t hang out as much, and talk with her about other activities and social groups that she’s not involved in. Paint your life as desirable and more than meets the eye. By deliberately excluding her, you will make her yearn to be part of that world. Dating a long-time friend is all about portraying yourself in a different light. You have to do that with your lifestyle, too. If you’re sitting together, introduce the subtlety of your legs touching each other, or gently stroking her lower back. Climb your way slowly up the ladder of physical intimacy. Dancing is also a great option, mixing fun and closeness. You’ve probably never introduced physicality into your dynamic with her, and you haven’t been shaping yourself as a sexual person when you’ve been around her. Invest the time. If you’ve followed the first three steps, you’ve already escalated the relationship, so that any physical closeness is automatically far less weird. Do you two have mutual friends? You may want to keep your new dynamic low-key, as it could change things. She needs time to adjust, and you need time to escalate tension. And if you start introducing these little physical touches, she’s going to get self-conscious if friends are present. Two friends dating is only weird for people who aren’t tasteful and classy about escalating. If you demonstrate all the values she wants around her in a friendship, there are only a few extra behaviours you need to make the relationship sexual. The real question is how to ask out a friend out when the time is right. This should be a more natural progression, having changed your behaviour and ramped up tension; there should be heaps of sexual chemistry. It should feel unnatural not to progress to the next stage. If she has been complying with the increased physicality, she’s on board with what’s happening, and her anticipation should already be rising for something to go down. If she says something like, “no, let’s just stay friends,” tell her you can’t do that. Put everything on the table. She may still be hesitant despite going along with the increased physicality – perhaps she is worried what the other people in your circle of friends will think. In any case, you won’t be able to go back to your friendship. This being said, it was a friendship continuing under false pretenses, and at least you did something about it. People win at relationships when they realise they’re dating their best friend after getting to know them. If you already know each other extremely well, you’ve already got that basis covered. You’ve got what most people aim for – a solid foundation. Just focus on keeping it exciting, and take the lead as you would when dating any other woman. To master seducing women inside and outside your social circle, visit www.johnnycassell.com/pua-training and book yourself a 7-Day Course today.